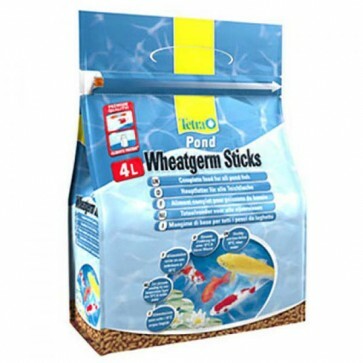 Tetra Pond Koi Wheatgerm Sticks are a Complete & Nutritionally Balanced diet that are suitable for all pond fish, during the colder months of the year, for instance Goldfish & Orfe, that Quickly Soften on the water surface, allowing the food to be Easily Digested by your fish, ensuring less waste and therefore improved water quality. Tetra Pond's High Quality Wheatgerm formulation is extremely easy for fish to digest and forms a Perfectly Balanced diet which will stimulate both Growth & Fertility as well as ensuring your fish are kept Active & Healthy.
. Ideal for all Koi & Pond Fish during the Colder Months of the Year. Feed 2 or 3 times a day.